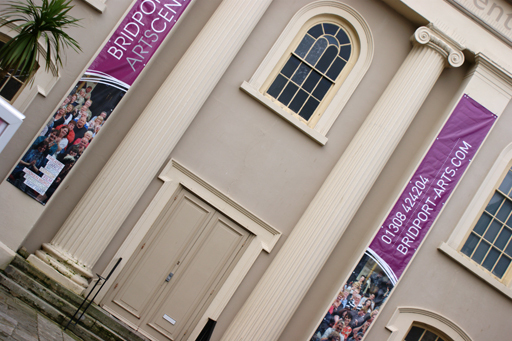 In some ways the experience of stepping into Bridport Arts Centre is a lot like entering the CuCo design studio – there is the potential to be exposed to new ideas, learn a great deal about yourself and what you like, and above all be inspired! So when long-standing CuCo client Bridport Arts Centre approached us in the lead up to their 40th birthday, we knew they it was time to shout about Bridport Arts, and they deserved something big. Two big things in fact! Cue these two, 3m long external banners. With this new advertising platform in place, the front of Bridport Arts Centre now offers passers by a feel for the charisma of the Arts Centre. It showcases this vibrant and diverse venue, which throughout the year plays host to spectacles in theatre, comedy, music, dance, film and much more. 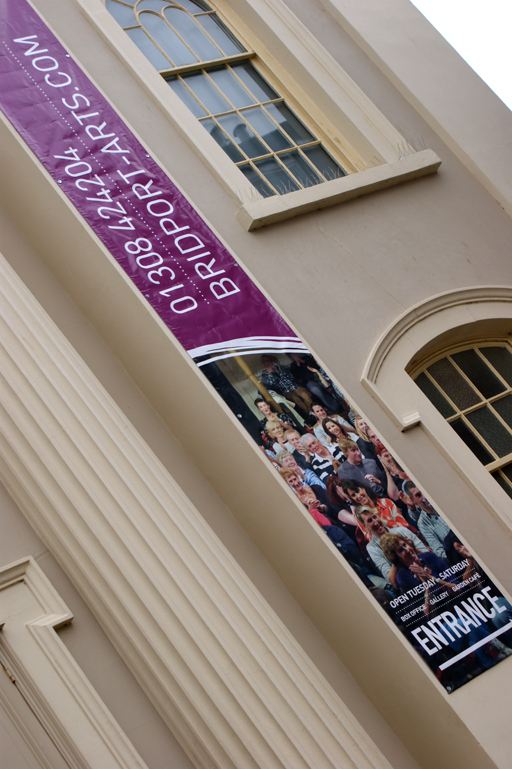 With both regular and new visitors to Bridport Arts Centre commenting on how strong and striking the banners look, we are confident that it will inspire more and more people, both locals and tourists to discover all that Bridport Arts have to offer in 2014. Why not pop down and see them for yourself? If your brand needs any help with the design of promotional materials, contact CuCo today on 01202 911959 or email us at hello@cucocreative.co.uk – We’d love to help! Next Post: Oceanarium Creative Finally Revealed! Claudia is CuCo's Head of Marketing & Communications, and has headed up our Marketing Team for the past 6 years. Her industry experience spans both agency and client side and she has worked at several top Dorset advertising agencies throughout her career. She also has a BSc degree in Psychology from a Top 10 University. Her main responsibilities lie in short and long-marketing consultation with our clients, ensuring brand consideration and purchase. Claudia works on several of CuCo’s top accounts across disciplines including content writing, blogs, Facebook advertising, email marketing, SEO and more. Enthusiastic yet focused, Claudia ensures everyone leaves the studio with a smile.